Originally published under the title "Why Would Facebook Censor Me?" 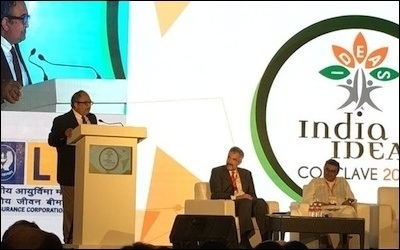 Tarek Fatah (left) and Middle East Forum President Daniel Pipes (center) at the India Ideas Conclave earlier this month. Three weeks ago, just as I flew to India to speak at the "India Ideas Conclave" in Goa about international jihadi terrorism, I received a warning message from Facebook. The social media conglomerate said I could no longer post any messages on my timeline addressed to my 80,000 friends and followers worldwide. It said I had violated Facebook's "community standards." My offence? I had shared a video that implicated Islamic State (ISIS) in committing war crimes against enemy prisoners of war. As much as I was shocked to learn of Facebook's decision, the irony was I found the video on Facebook. It did not show beheadings and I had labeled the post with a warning of graphic violence, and that "viewer discretion is advised". None of that mattered. For days, I tried to reach Facebook, with no success. I discovered that Facebook's security was apparently being handled out of an office in Hyderabad, India, home to some of that country's leading and most vocal Islamists. 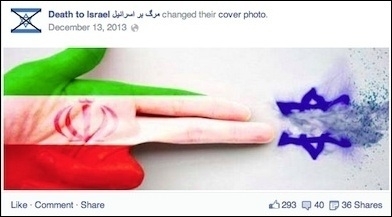 Last year, Facebook reviewed a page entitled "Death to Israel" with the above profile image and determined it didn't violate the company's "community standards." In the meantime, some of my followers, none of whom I know personally, set up a group on Facebook demanding "Bring Back Tarek Fatah," with no response. When I tried to set up a new account, Facebook disabled it. Next, I took to Twitter, writing an open letter to Facebook. I received a response from a spokesperson for the social media site, who did not address the issue of Facebook censoring me. The message said: "With regards to your note on Facebook's security, we have a Community Operations team that works in Facebook offices around the world, these are highly trained members of the Facebook team and they review reports based on urgency and time zone, so it's not the case that reports are only reviewed from our Hyderabad office". That was little comfort to me. All around the world attacks by ISIS are shaking up our lives. Paris was hit, Brussels paralyzed, Mali attacked. India and other countries have acknowledged some of their young Muslims are joining ISIS, yet Facebook silences me, a vociferous Muslim critic of ISIS? I asked Facebook how a video on ISIS war crimes violated "community standards" but did not receive a reply. If Facebook insists on punishing those of us who put our lives at risk to fight the ISIS scourge -- death threats are common for Muslim writers who publicly denounce the terrorist group -- then the social media giant should hang its head in shame. Facebook's "community standards" let terrorists communicate freely, but not those fighting them. Facebook's attempt to silence me comes in the wake of Jerusalem lawyer Nitsana Darshan-Leitner's recent lawsuit against it, filed in New York, on behalf of a terror attack victim and 20,000 other Israelis. in a bid to get the company to monitor and remove posts advocating violence. The Toronto Sun's Don Peat, reporting from Israel, wrote how hours before one terrorist attack, a jihadi publicly posted on his Facebook page what he was going to do with the hashtag "stab Jews". He was then encouraged to do it by Facebook friends — and celebrated online afterwards. There is something wrong with Facebook's "community standards" if terrorists can communicate freely, but a Muslim fighting Islamism and jihadi terrorism cannot.